Following on from my EGG-Spert review of Chocolatier & Chocolate Manufacturer’s Easter 2016 Chocolate Egg Selections, I now focus upon EGG-citing Chocolate Easter Eggs, Chocolate Mini Eggs and Chocolate Figurines with EGG-sactly NO GLUTEN CONTAINING INGREDIENTS and GLUTEN FREE offerings from EGG-ceptional High Street Supermarket’s Own-Labelled products. As I love my Chocolate Bars, Chocolate Bags and Chocolate Boxes, I found myself EGG-xamining Ingredients, Allergen Information and photographing this year’s offerings for Easter 2016. A separate Blog post will cover some EGG-traordinarily Luxurious Chocolate Easter delights (including Harrods, Fortnum & Mason and Selfridges) and a previous post covers Chocolatiers and Chocolate Manufacturers. Chocolate Easter Eggs and Chocolate Figurines which are GLUTEN FREE or have NO GLUTEN CONTAINING Ingredients (and no warnings or “may contains”) as at March 2016. Pictures of the items with ingredients shown for selective products (and typed out where it is particularly difficult to read the packaging). Items made with NO GLUTEN CONTAINING INGREDIENTS. Warnings have been highlighted from packaging. The listings includes Chocolate Easter products by Asda, The Co-Operative, Holland & Barrett, Lidl, Marks & Spencer, Sainsburys, Tescos and Waitrose. Some of the Chocolate Easter Eggs are SOYA FREE, DAIRY FREE, EGG FREE, NO ADDED SUGAR and DAIRY FREE. All are GLUTEN FREE. Links have been included: direct to High Street Supermarket’s websites. It is accurate at the time of publishing (March 2016) but manufacturers do change their mixes so you should always read the labels before you put anything in your mouth and enjoy! It’s your own responsibility to remain GLUTEN FREE. THE CO-OPERATIVE: On many High-Streets across the UK, they have a large range of own-labelled Easter Products alongside Chocolatier and Chocolate Manufacturer’s products. Hollow Milk Chocolate Hen with white chocolate, dark chocolate & decorative glaze, with hollow nest and Mini eggs by LIDL. Contains MILK, HAZELNUTS, PISTACHIO NUTS, SOYA & SULPHITES. SAINSBURYS: For Easter 2016, they have an EGG-stremely colourful selection of EGGS, some of which are GLUTEN FREE. Contains SOYA. States “Suitable for Coeliacs” so thank you Sainsburys. Egg contains MILK & SOYA. Caramels contain MILK & SOYA. HESTON from Waitrose Golden Egg (with Mini Eggs made with a blend of white and milk chocolate filled with mandarin ganache nestled on a edible vanilla flavoured nest). If you “Like” my Facebook page you will automatically receive new posts into yourFacebook Newsfeed. If you are a member of Coeliac UK, they produce a comprehensive directory which covers over 16,000 food and drink items (including GLUTEN FREE Chocolate Bars). This is available in a paper-based Manual and online FREE to members of Coeliac UK. They have also published an Easter listing (although it is not as visually EGG-citing as this posting and excludes some of the included Chocolatiers in my previous post nor all the Supermarket Chains as above). One of the hard-hitting posters from Coeliac UK for Awareness Week. One of the hard-hitting posters (featuring Yours Truly) from Coeliac UK launched for Awareness Week, held in 2015 and to be seen later in 2016. A separate Blog post covers EGG-citing listings includes Chocolate Easter products by Cadburys, Mars, Nestle, Booja Booja, Bon Bon Buddies, Butlers, Celtic Chocolates, Cocalibre, D&D, Green & Blacks, Kinder, Kinnerton, Lindt, Montezuma’s, Plamil and Thorntons. and a further Blog post will share some EGG-traordinarily Luxurious Chocolate Easter delights (including Fortnum & Mason, Harrods, Harvey Nichols and Selfridges). This information was correct as of March 2016. 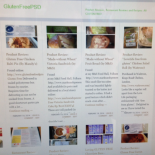 This entry was posted on March 11, 2016 by glutenfreepsd in Photographs, Product Review: and tagged Easter 2016, Free From Easter Eggs, Gluten Free Asda, Gluten Free Easter Eggs, Gluten Free Lidl, gluten-free-M&S, gluten-free-waitrose, Holland and Barrett, UK Supermarkets Easter.